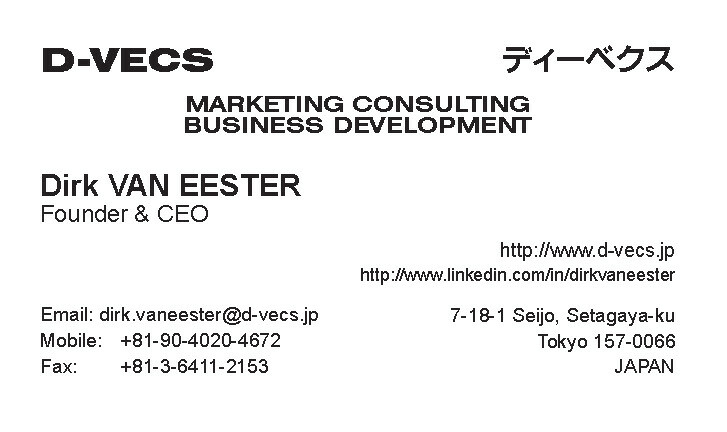 Japanese business etiquette requires very frequent exchanges of business cards. If you are going to meet people, make sure you have an ample supply. Count on about 10 cards per day. For a tradeshow you might need as many as 30 per day. De Japanse beleefdheidsregels vereisen het zeer frequent uitwisselen van naamkaartjes. Als je tijdens je trip mensen gaat tegenkomen, zorg je er best voor om er een grote voorraad van bij te hebben. Reken op ongeveer 10 naamkaartjes per dag. Voor een handelsbeurs kan je er zelfs 30 per dag nodig hebben. 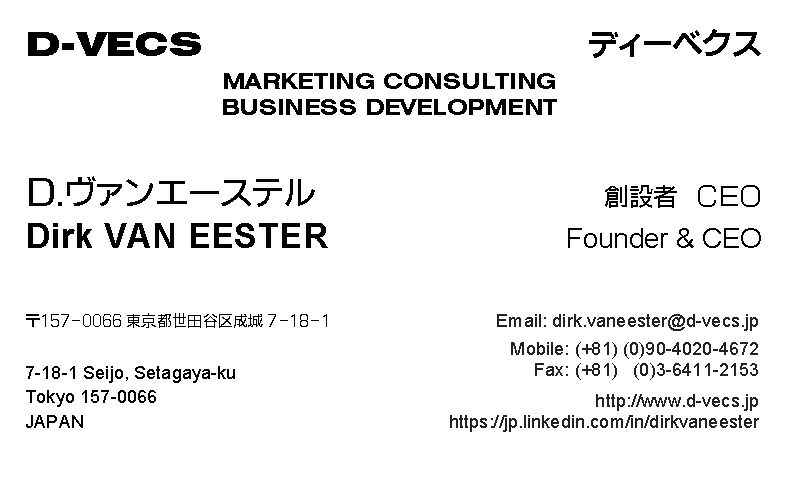 If you have access to Japanese printing, it would be a nice touch if your business cards are bilingual, either both languages on one side but preferably one side in your customary language, the other side in Japanese. 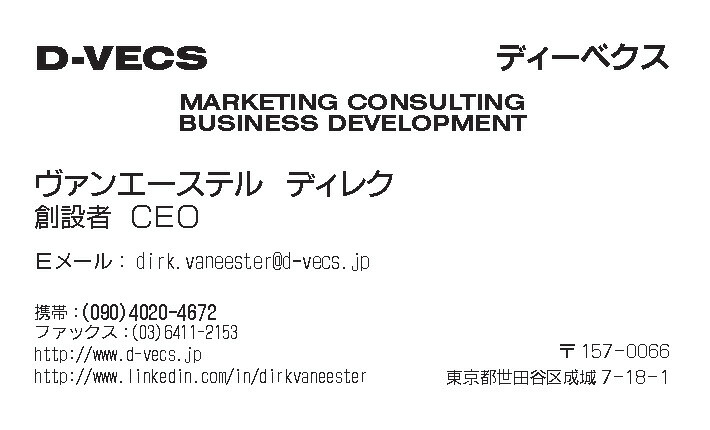 This is an aspect of your Japan-business that D-VECS can assist you with. Als je toegang hebt tot Japans drukwerk, zou het mooi zijn indien je je kaartjes tweetalig kon maken, ofwel beide talen op een kant of beter nog, een zijde in je normale taal en een zijde in het Japans. D-VECS kan je natuurlijk ook helpen bij dit aspect van je business. When you receive a business card at the beginning of a meeting it is not only "polite" to carefully study it, it makes good business sense: if you are facing more people over a business negotiation or a product presentation, it is very important for you to understand who in the team has power and who has knowledge. The meishi will normally give you good hints to this information. The first hint at the level of a person or of his power in the organization, is his Japanese title. In Japan "chairman of the board" is often a honorary function that is given to a semi-retired former CEO. However, in some companies this person is still wielding a lot of unofficial influence. 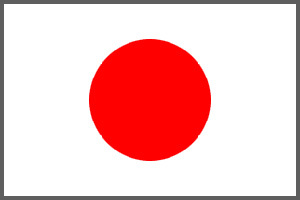 Members of the board are in Japan often chosen from the powerful operational business managers. You have simple board members, "torishimariyaku", and board members who have the right to represent the company, "daihyo torishimariyaku". Next we come to the major components of a company. In recent years Japanese companies started designating divisions with their own P&L as "COMPANY". The head of such an inside company might have the title of President (see above). More traditional are the divisions ("jigyobu") with departments ("bu") and sections ("ka"). These are headed by a jigyobucho, bucho and kacho. In larger companies, a "kakaricho" might lead 2 to 4 people within a section. In between "bu" and "jigyobu", you might find "honbu", headed by a honbucho. Sometimes you will encounter "TEAM"s headed by a "TEAMLEADER" or "MANAGER". This type of nomenclature is especially useful for companies that want to do a major reshuffling of titles without embarrassing people through apparent demotions and promotions.